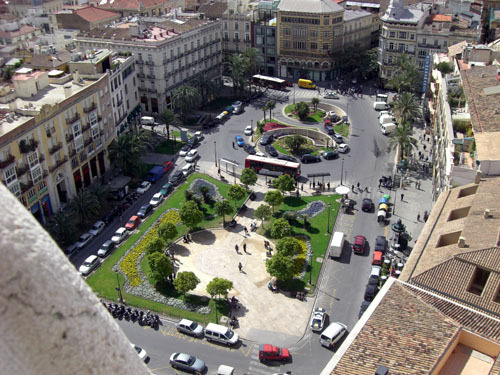 The literal center of Valencia is La Plaza de la Reina (location) — it marks the city’s “Kilometer 0”, and is the reference for the building numbers. Despite its odd shape, noisiness, and heavy pedestrian & vehicular traffic, La Plaza de la Reina still is one of the most impressive corners of Valencia. A huge number of streets converge here, including Cabillers, Bordadores, Paz and del Mar, making it one of the plazas you’ll become most acquainted with during any visit to the city. 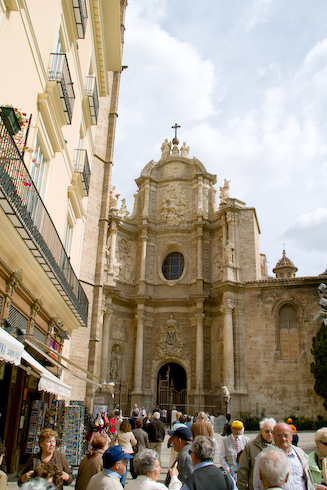 A majestic crown on the northern tip of the plaza is provided by the baroque entrance to the city cathedral. This doorway was constructed in the early 1700s, and is noteworthy for its disorienting concave shape. Just within that doorway, you’ll find the access to the 200+ stairs of Micalet tower. If you climb these, you’ll be rewarded with the best aerial view of the Plaza de la Reina imaginable. From here, the plaza looks like a pregnant rectangle. There’s a small, green park on the north side (used mainly by dogs), and on the south side is an interesting figure 8 shape created by the entrance to and exit from a parking garage. If you get hungry while in Plaza de la Reina, skip McDonald’s in favor of 100 Montaditos — here you can choose from a hundred cheap, delicious little sandwiches. Here are some other pictures we’ve taken of Plaza de la Reina. Did you guys see the foto exhibit of Valencia at the Museo de Prehistoria? Do not know if it is still there. It had some great fotos of the city from the 19th and early 20th century. The door to the Cathedral finally made sense to me seeing it at the end of the narrow street that was where your foto was taken. Pl de La Reina has grown a few times as has Pl de La Virgen.